(a) if the camera is not installed exactly correctly with its mounting plates and parts positioned so that it prevents the housing from closing 100%...this can result in a rapid filling of the housing with fresh or salt water...ruining not only the camera and the housing but also YOUR DAY. (b) if the camera installation is just a fraction off center all your images may be vignetted, or in other words, the housing itself shows in the corners of the picture. (c) if the camera installation does not exactly match up all the controls and cables there may be a malfunction of run control or interference with focusing or zooming, just some examples. We have been inventing underwater housings since the early 1970s and have done thousands of rental days with underwater equipment. In the early days we DID listen and obey the request to RENT A HOUSING ALONE, without a camera, because the customer already OWNED A CAMERA. The horror stories started to collect and as a result we instituted a policy to rent housings alone only if the operator came into our offices and went through an orientation and training, learning all the little tricks about how to get the housing sealed completely, and the camera aligned exactly so that it worked 100% and there were no corners being cut on the pictures. If you are doing a long-term project, and have your own camera, we will welcome your shooter or assistant in our prep facility, and will spend the time to completely familiarize them with all the tricks to insure a perfect production. One last note: setting up a camera in a deep water housing usually requires certain disassembly of the stock video camera before it will fit into the housing properly. It usually makes all the sense to have a topside and an underwater camera system both ready to shoot at a moment's notice. It takes time and patience to get the installation just right, and that is IN A CONTROLLED, WELL LIT, NON MOVING LOCATION! Big hands? Small hands? Gloves / no gloves? Nauticam has you covered. Electronics include standard leak detection; add your choice of 14mm vacuum valve for extra layer of integrity monitoring. •Nikonos bulkhead for electrical sync. The Amphibico "GENESIS" line of compact Prosumer HD housings is proud to announce its next creation for the Sony NEX-FS700 camera. The Sony NEX-FS700U Super 35 Camcorder is a fully professional large-sensor, 4k video camera.As for the housing, it is built with the same high quality solid aluminum construction as our previous pro line of housings, no compromise was taken to create the New "GENESIS" line from Amphibico. Keeping in mind total ergonomics and underwater balance, its compact design with an intergraded electronic grip system makes the unit extremely user friendly underwater. Our engineers worked very diligently on its design, keeping in mind size, weight, balance and it's on board electronics allowing easy and complete access to all key camcorder functions, it will give users the ability to create the best possible HD video underwater. White Balance, ISO, Slo-Mo, Playback, etc., with access to all internal menus. - Controls that are ergonomically located for convenience and ease of use. - Over 3 hours of battery life. - Top or rear mounted video monitors... or use both. Other lens and port options available at additional cost. Gates underwater housing for Sony PMW-EX1 XDCAM EX. Comes with Gates SP44 Standard Port. Comprehensively endowed with pro features, the Gates EX1 Housing in engineered for the discriminating professional. Adjustable handles provide perfect grip and fingertip access to over 20 different functions. Includes a Sony PMW-EX1 XDCAM, one 32GB memory card, and SP44 Standard Port,Shown. The Gates SWP44c Fathom Imaging Wide Angle Port is designed for use with the Gates EX1, EX1R underwater Housings. Made of 9 elements of glass, with corner to corner sharpness, the Gates SWP44c allows full zoom through capability and up to 120 degrees Field of View. The SEACAM silver for the CANON EOS5D MKII sets new standards in design and ergonomics. Due to the special construction, the mounting of the camera is especially easy. The housing is milled out of a saltwater-proof light metal alloy twice hardened and high-value anodized. Special longevity is achieved through use of materials of only the best quality: stainless steel, anodized aluminum, premium synthetics as well as Helicoil threads. Double sealing with seamless, high-quality precision O-rings protects all shafts and press buttons. The main O-ring is of a particularly strong dimension. A titanium SAFETY LOCK fastening system safely secures both housing shells. An interchangeable viewfinder system includes 4 different viewfinders and can be exchanged without any tools. The easy mounting system and the double O-ring sealing particularly secures the SEACAM front port connection with its bayonet thread. The SEACAM silver for the CANON EOS1D/DS MK IV sets new standards in design and ergonomics. Due to the special construction, the mounting of the camera is especially easy. The housing is milled out of a saltwater-proof light metal alloy twice hardened and high-value anodized. Special longevity is achieved through use of materials of only the best quality: stainless steel, anodized aluminum, premium synthetics as well as Helicoil threads. Double sealing with seamless, high-quality precision O-rings protects all shafts and press buttons. The main O-ring is of a particularly strong dimension. Two secured quick-lock latches safely secure both housing shells. The interchangeable viewfinder system includes 4 different viewfinders and can be exchanged without any tools. The easy mounting system and the double O-ring sealing particularly secures the SEACAM front port connection with its bayonet thread. This Aquatica housing for the Canon 5D Mark II is machined from a solid block of aluminum that is anodized, coated with polyurethane powder paint, and then clear coated. The housing operates safely to a depth of 300' (90m). The lens port has a positive mounting and locking mechanism, which leaves no doubt that your port is securely in place and watertight. The bayonet system offers fast access to lenses for rapid changing, and there is a lens release button on the front of the housing to facilitate easy lens changes. However in order to make your shoot a 100% positive experience with no flooding of the camera and housing or other operational issues we make a super Deal for the complete housing-camera-lens-memory-batteries package. The lens is a Canon 16mm-35mm 2.8 zoom lens. Other lenses can be fitted upon request. The housing features double 2-pin Nikonos bulkheads. This allows you to easily connect two strobes with two standard Nikonos single sync cords to the housing. The Aquatica 5D Mark III housing uses a viewfinder that delivers a big and bright image and full frame viewing to your eye. LCD information in the camera's viewfinder is easily referenced while shooting, and chromatic aberrations have been significantly reduced for sharp focusing and exact composition. The Sea & Sea MDX-5D MKII housing is designed for professional underwater photographers. The housing is machined from a solid block of aluminum and is designed for ultimate precision, ergonomics and performance. It is durable and stands up to tough use. The MDX-5D MKII allows for full use of the Canon EOS 5D Mark II functions underwater. The snug design keeps the housing compact and lightweight, enabling greater maneuverability and ease of use. The controls are easily accessed and are responsive. The housing has many features that will nurture your creativity. The pickup viewfinder magnifies your view by 0.5x for clear corner-to-corner framing. There is one Nikonos two-pin and one six-pin connector. You can use the optional TTL converter for TTL flash control with the 6-pin connector. A wide array of NX ports will accommodate the extensive array of Canon interchangeable lenses in the Sea and Sea housing. Nauticam is happy to release the Nauticam NA-7D underwater housing for the Canon 7D Digital SLR. Video enthusiasts will appreciate the special attention given to the video/still photo mode switch and video start/stop button and their convenient proximity to the right grip. Nauticam shooters can switch from still photo to video shooting, and start recording a video clip, without removing their right hand from the handle. No awkward camera shake inducing reaches are required! An underwater photographer should not have to remove their hands from the housing handles. With the Nauticam Canon 7d Underwater Housing, every control placement decision made during the design of the housing was based on this principal. Long reaches are an awkward compromise, and this housing requires none! The Nauticam NA-7d underwater housing allows Fingertip access to Shutter Release, Main Control Dial, Quick Control Dial, AF-ON, Still Photo/Video Mode, Video Start/Stop, Star, AF Point Selection, and Set are all offered from the soft rubber overmolded right grip. AF-On, Still Photo/Video Mode, and Video Start/Stop are operated by ergonomic thumb levers. Star, AF Point Selection, and Set are accessed by "piano key" controls built into the backplate of the housing, and easily reached from the right grip. Shutter release is operated via a sensitive, sculpted lever. The Main Control Dial and Quick Control Dial are accessed by enlarged knurled knobs that allow one finger operation. Engineered for the working professional, the HVX200 Housing is a comprehensive inventory of features for serious underwater imaging. Adjustable handles provide perfect grip and easy access to critical functions like white balance, iris, manual focus, and user presets. Bayonet mounted ports allow quick change amongst Flat, Dome and Super Wide angle enabling the clearest, sharpest images possible -- a necessary requisite for HD endeavors. The HVX200 Housing is classically Gates: durable "bulletproof" machines aluminum and 100% reliable mechanical controls. Package includes not only the Gates Housing but also a Panasonic HVX200 camera and one 16GB P2 card. Comes with SP44 Standard Port. Shown with optional SWP44 Super Wide Port. The Gates SWP44c Fathom Imaging Wide Angle Port is designed for use with the Gates HVX200a underwater Housings. Made of 9 elements of glass, with corner to corner sharpness, the Gates SWP44c allows full zoom through capability and up to 120 degrees Field of View. 1080i/720P, PAL/NTSC, 110mm Color LCD Monitor. The Gates EM43 is a big 4.3" / 110mm color active matrix LCD to assist with framing and focus - even in bright sunlight. Sophisticated features like power-on and auto-format sensing mean no worries about accidental battery depletion or different worldwide formats. Seal Check provides a fast and easy verification of your housing integrity before submersion in the water. This is the best possible way to check for damaged or compromised O-rings and seals before you have a flood or minor leak that could cost a lot of down time or money. The Seal Check housing valve has to be installed on your Gates housing at the time of your new order or you can send in your current housing and Gates will do the post installation for a small fee. The New BLuFISH 2 HD underwater housing for the Toshiba IK-HR1S miniature HD camera, provides a revolutionary High Definition remote head point of view camera system providing a high-performance, multi-format solution in a small package. Enter the world of underwater with the smallest HD POV cameras on the market today. The BLuFISH 2 HD was designed and manufactured by Air Sea Land Gear, an Emmy-award winning company for POV innovation and design. Ideal for applications that require a camera on a pole, dangerous locations, extreme environments and for outdoor installations. Quarter-inch taps allow the housing to be mounted to multiple grip arms and devices. The housing can accommodate the Fuji 2.8mm and 4mm C-mount lenses. (Fuji TF2.8DA-8 and TF4DA-8). This solid aluminum housing has been pressure tested to over 100m. Includes Toshiba IK-HR1S camera, dome and flat port, Fuji 2.8mm and 4mm C-Mount lenses. This is the extension pole for the Bluefish 2 HD underwater housing. The pole has an integrated tilt mechanism and is perfect for shooting video in a swimming pool while the camera operator never gets their feet wet. The Amphibico Phenom FXZ1 Basic Electronic Underwater Housing for the Sony HDR-FX1 and HVR-Z1U high definition camcorder is designed with the professional camcorder operator in mind. The housing is constructed with marine grade aluminum and 2 coats of polyurethane with marine grade brass and stainless steel hardware that will allow the camcorder to operate up to a depth of 330' with full camcorder functions. Electronic controls provide access to all functions of the camcorder. Other features include a moisture sensor alarm, flashing green tally light when recording and a internal filter ring. The optics include a $3000 Phenoms and Endeavor 94 degree wide angle lens assembly at no additional charge. This housing includes a complete Z1U camera (set at NTSC or PAL per your request). There is no charge for the camera which has been carefully configured to exactly fit into the housing. Various modifications have to be made to the camera in order to fit the housing properly and line up 100% so there is no issue of vignetting when you return to the edit suite. This system also comes with FREE 63 minute tape already installed! Amphibicam underwater package with Sony HDW F900 + 4.5x13 specially adapted wide angle Fujinon lens. This premier HD underwater housing package works to 100 meters (330 feet). Designed for the most discriminating underwater videographer, the Aqua Video MC-HC3 is a rugged, reliable, high quality Marine Case for the Sony HDR-HC3 high definition camcorder. Suitable for wet weather, water sports, and underwater video applications to depths of 90 meters/300 feet, it is compact, easy to set up, and easy to use. Designed to be used with an accessory wide angle converter (supplied) it provides extreme wide angle of view for dramatically clearer, more colorful underwater pictures. The dome port optical system corrects for distortions and aberrations that would otherwise occur, yet allows true, magnified macro and zooming functions - without having to change lenses or optical setup (to about 50% of zoom range - full range can be easily achieved with a diopter). An optional underwater color correction filter is also available. This is rented as a fully-functional system, checked out and camera installed with a tape in it, ready to shoot. Includes a fully operational Sony PD170 camera loaded with fresh tape and battery...ready to shoot the first 40 minutes of DVCAM quality tape. Custom adaptations with external video or audio connections are all available. Lights and communications systems are also available elsewhere in the Underwater department. UW housing camera For Panasonic DVX100. Constructed with rugged and durable PVC material and one inch cast acrylic front and rear faceplates with stainless steel hardware that eliminates corrosion and condensation for long lasting experience with housing. Housing is delivered complete with fully set up and adjusted camera, battery, and loaded with tape. Beta cam Underwater System. 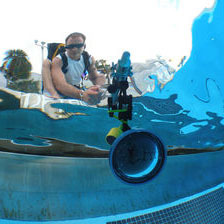 One-piece underwater broadcast includes Sony BVP550 camera, SP recorder, 5.5-47mm Fujinon motorized zoom lens with Sony paint box built into the housing. NTSC "Three Chip" 3CCD miniature "Ice Cube" color camera with underwater housing. PAL 3CCD miniature "Ice Cube" color camera with underwater housing. CCD color 6" long miniature "cigar" camera together with underwater housing, ready to shoot (requires NTSC recorder of some kind). 5D Mark IV is the embodiment of a hybrid camera system, providing compelling feature sets for still photo and video capture underwater. Never before has there been a camera that excels so well at both disciplines. Still photographers will love the 61 point autofocus system shared with 1DX Mark II for its fast acquisition and reliable tracking of moving subjects. The new 30 megapixel sensor with on chip analog to digital conversion offers plenty of resolution with high dynamic range capture ideal for pulling shadow and mid-tone detail out of strongly backlit images. The Phenom Z7LE for the Sony HVR-Z7U HDV Camcorder is an electronic and mechanical housing which gives complete control of your camcorder when filming your underwater scenes. It is constructed from high quality marine grade aluminum and fully anodized with a hard coat of polyurethane paint, including a clear coat. Pressure tested for 330 feet, you are certain to dive deep. On land 36 lbs. (16.3kg) fully loaded w/camera NP970 battery, lens and lead ballasts. This housing includes a complete Z7Ucamera (set at NTSC or PAL per your request). There is no charge for the camera which has been carefully configured to exactly fit into the housing. Various modifications have to be made to the camera in order to fit the housing properly and line up 100% so there is no issue of vignetting when you return to the edit suite. The SmallHD 502 is the sharpest and lightest 5-inch field monitor available, and the perfect complement to a Nauticam underwater video system. It combines a stunning 5", 1920 x 1080 Full HD Display with an amazing suite of software tools for image monitoring in a compact form factor. The monitor feels immediately familiar, almost identical in size to your favorite smart phone. A rubberized joystick is used to effortlessly flip through video "pages". Each page accepts multiple imagine analysis tools, configured by the user for their individual needs. The NA-502 housing provides access to all monitor controls, and the complete menu system is available in the housing, and at depth. The Nauticam NA-502 housing features the rugged build quality and advanced manufacturing expertise our user base has come to expect. The joystick navigation system used is translated to four directional arrows, a center select button, and the dedicated "back" button. The interface is simple, but elegant, and perfectly suited to the underwater environment. The form factor of the 502 monitor is ideal for an underwater housing, with HDMI / HD-SDI cables nestled between two readily available Canon LP-E6 Batteries. HDMI and HD-SDI 502 is supported by a single housing, providing an extremely broad range of camera support in a single underwater monitor system. Highlights in focus edges, taking the guess work out of critical focus even when using large format SLR cameras with narrow depth of field. Extremely useful for judging exposure, false color mode maps the IRE Exposure Scale to color bars, providing detailed feedback about image brightness. Purple and Yellow warnings indicate under and over exposed areas. A gradient from blue through green maps shadows to highlights. Zooming in on the video feed is available from every monitor page, all the time, simply by clicking the up arrow. The zoomed window can be moved around the screen via up/down/left/right, and exited easily with the back button. Designed to warn of over exposure, zebra lines can be mapped to a custom IRE level, and even enhanced with color to make them more visible. Right angle cable connector provides clean cable routing, and protects the cable from wear and tear at the housing connection. Joystick navigation is translated to a 5 push button directional pad on the housing front, with enhanced spacing that is easy to use even when wearing gloves. A Vacuum Valve, along with the Nauticam Vacuum Check and Leak Detection System is included as standard equipment.. A temperature compensated monitoring circuit with LED indicator provides constant feedback about vacuum status. The green led means the system is safe to dive!